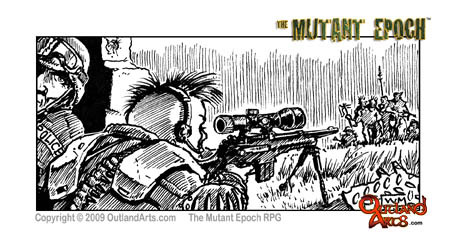 The Mutant Epoch:: A preview of the Outland System RPG game mechanic. 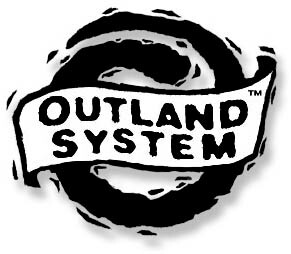 The outland system is unique in its rules, tables, charts, and list usage, however, it is a traditional RPG system in that it employs many of the expected, successful and necessary elements to make for satisfying, fast paced adventure action while still playable with as much character to character interaction and story narrative as desired. The rules are in depth enough to satisfy the experienced gamer, but not needlessly complicated or wordy that it would confuse or ‘turn off’ a new player. We’ve taken the same stance that works so well for well crafted fiction in as much as when one reads a book, the writer and writing should not be the focus, but rather the story and characters involved. In developing the Outland System, a primary goal was to keep the focus on the role-playing instead of the rules, and while a game master should be familiar with the game mechanic, or at least know where to look for a specific rule, even first time players should be able to get into a session without having to do much, if any, reading beforehand or complex math during play or character generation. Gamers love their dice, end of story. We also love dice, so over the years, we’ve made sure that every one of the polyhedron dice are called for. For the most part, however, where other games focus on the six or twenty sided dice, the Outland System mainly uses the ten sided or percentile (d100) dice for much of its combat resolution, character generation, task resolution and assorted tables. Of course, different mutations, weapon damages, encounter tables, outfitting tables and countless other charts, tables and matrixes require the use of the full dice set, so bring them all. It is recommended that each player have his or her own set of polyhedron dice. The actual method of inflicting harm on an opponent is a two step process, familiar to many who have played other RPGs. In the Outland System, one uses his or her Strike Value (SV), minus the target’s Defense Value (DV) to get a resulting target number or stroke range. Roll the target numbers or less on a d100 roll to strike the target. Damage is inflicted on the victim and deducted from its endurance (END) value. When a being reaches zero endurance, it is incapacitated, but depending on its overall size (starting endurance) it may only be unconscious, slowly dying or outright dead. A defender’s agility trait value modifier, armor, using cover, zig-zagging, or using the dodge skill if acquired by the character, will make a person harder to strike, while the attacker’s skill, rank, accuracy trait value modifier, weapon modifiers and additional technology and tactics will all improve the attacker’s chance to ‘strike’ the defender. For the average human, a single sword thrust or gun shot or two will dispatch the subject, or at least put him or her out of the fight and in need of first aid. In addition, the presence of submachine guns, chain guns, pulse rifles and multi-projectile mutations which can unleash more than one attack per round, make combat a lethal undertaking. Without decent armor, quick thinking, use of cover or other tactics, character death is to be expected. The Mutant Epoch is a somewhat dark, survival focused setting, where combat is brutal, bloody and swift, using clear, logical rules that even a new player can grasp within his or her first engagement. ► Dice Usage: The Mutant Epoch:: A preview of the Outland System RPG game mechanic. ► Combat: The Mutant Epoch:: A preview of the Outland System RPG game mechanic.